My dear brethren, I believe that what I have to say is a companion to what Bishop Brown has already spoken tonight. And I trust that the Spirit of the Lord will bless its delivery. Without presuming to be an authority on the subject of the priesthood, I have nevertheless spent years along with you considering its purpose and the power which pertains to it. 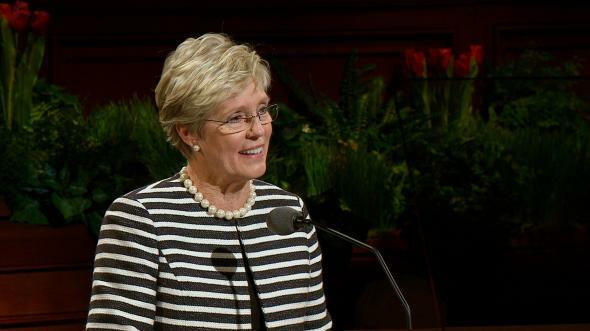 In the Church, testimonies are often expressed in general terms. For example, we speak of our knowledge that God lives, that Jesus is the Christ, and that this is the true Church. There are times, however, when we do not always show the same faith in more specific parts of the gospel. I have heard some say that they believe in everything but the welfare plan or everything except tithing. 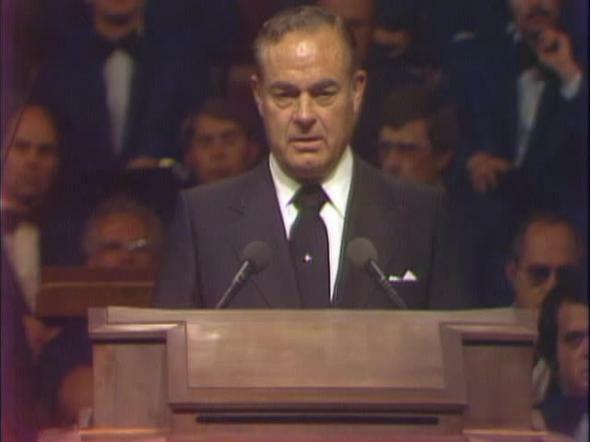 Some people used to say they could follow the Prophet Joseph Smith or David O. McKay, but not Brigham Young or Heber J. Grant. Now such selectivity is simply not consistent. How many brethren here are home teachers? Would you please raise your hands. Those of you who are listening in may also raise your hands. Now since we have just closed out the month of September, how many of you home teachers “got your home teaching done?” Well, brethren, that’s a catch phrase. You know, the devil taught us to say those words: “Did you get your home teaching done?” That is a very poor way to refer to the comprehensive mission embodied in home teaching. By getting us to ask “Did you get your home teaching done?” the devil destroys 90 percent of our effectiveness. All that question implies is a quick visit the last day of the month so that we can send in the report. I went to a conference in President Rex Reeve’s stake. He took me through the building and showed me 2,000 chairs prepared for the people. I asked him how he knew there would be 2,000 people present, and he answered, “We sent the home teachers out to invite everyone to come, and they have given us their report. They have informed us that 2,000 people will be here tomorrow.” Evidently the word got out that I would be one of the speakers because seventy-five of those 2,000 didn’t show up. But they had an attendance of 49 percent and it has since grown much higher. Five years ago if you had asked, “Who’s the ‘minister’ of your Church?” most of us would have answered, “Oh, the bishop.” Today we can’t give that simple answer because we know that many of the duties have now been shifted over to the elders, where the revelations say they rightfully belong. Now a ward should have at least fifty “ministers” in place of the one we thought of a few years ago. Now think of the increased power to carry the gospel forward when fifty men do their duty as the bishop has done it in the past. “Oh, but the home teachers won’t do it.” Well, do you have faith in the Lord’s system or don’t you, and why not try it? To further mention limited understanding concerning the priesthood, I refer you to an incident common in the fast and testimony meeting. Someone frequently gives the experience that a relative or friend was very ill and the elders were called in to administer to him. The person was healed. And so we say we have a testimony of the power of the priesthood. Now please understand, I do not belittle the virtue of this sacred and wonderful ordinance. It frequently means the difference between life and death for ourselves and our loved ones, and I have witnessed its marvelous influence. But why limit your testimony to that? Why not as readily send the elders to administer help to a father whose son is about to die spiritually on drugs or alcohol? Why not call on the priesthood to bless a home that is about to die through divorce or transgression? Why not administer through the priesthood to those who love the world more than God? 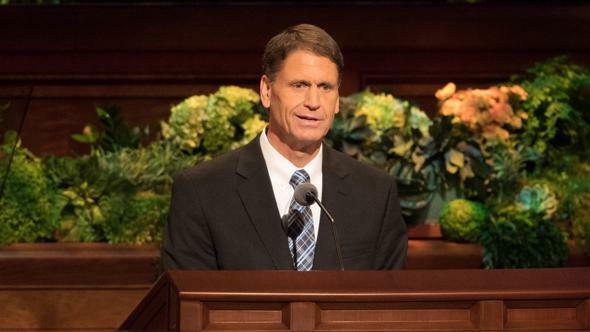 Why do we blithely say, “We did our home teaching” when half of the families in the Church are in a condition to be “wasted” when the Savior comes because they have not been “sealed up” to eternal life? There is a ministry here for the elders far more extensive than that of laying hands on the sick. A person healed of bodily sickness will eventually become sick again and die. When you administer the gospel, the cure can be permanent. Now you can see why I have a testimony of the power of the priesthood. I was told to go out and get one. And I really do have one. Our missionaries are out every day teaching people who don’t even believe in God. But because of the “great power” which has been given to them, and through their great faith, the Holy Ghost draws near to them. Its influence is felt, and people respond, repent, and obey. When these elders administer baptism to such a person, the teaching and the ordinance combine to be a powerful administration of the priesthood. Children of God are reborn into eternal life. And when this army of missionaries is increased from 10,000 to 20,000, the power of the priesthood is vastly increased. In the quorums the same thing ought to be true. If we expand from one “minister” to fifty, we should multiply the power of the priesthood by fifty. And the miracles they can perform should multiply vastly beyond those performed on the physically sick. When you have the great joy of hearing someone say, “There’s the man who brought me the gospel,” or “There is the man who changed my whole life,” you can bear your testimony to a great miracle. Now the priesthood president of deacons, teachers, and priests is the bishop and their quorum presidents. 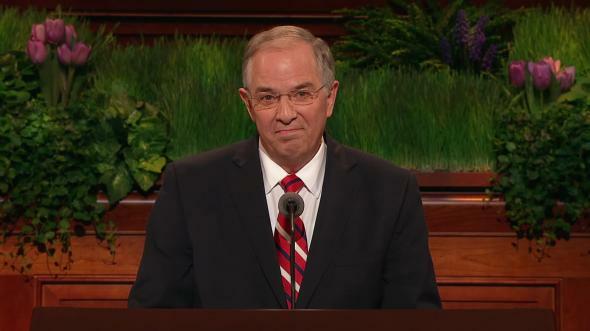 The priesthood president of fathers in the Church is the elders quorum president or, of course, in some cases the high priests and seventies presidents. All fathers must, says the scripture, “come unto this priesthood.” (D&C 84:42.) If not, their families will be subject to the judgment predicted by the prophet Malachi—wasted, not bound to fathers. (See D&C 2.) This is why the gospel was restored, so that the earth would not be wasted at His coming. 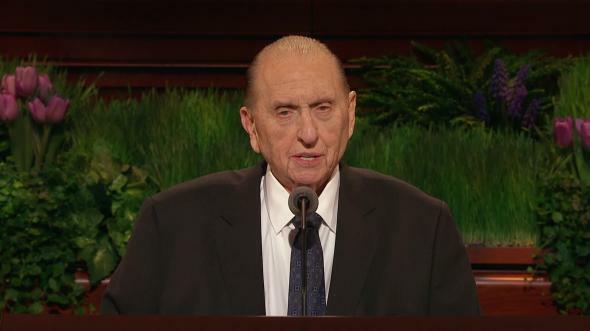 The Melchizedek Priesthood president, who is in most cases the elders quorum president, must see that the fulness of the gospel is administered to every member of the Church. That is the function of this priesthood. He should administer the gospel personally and through the “standing ministers” in his quorum, now called the home teachers. 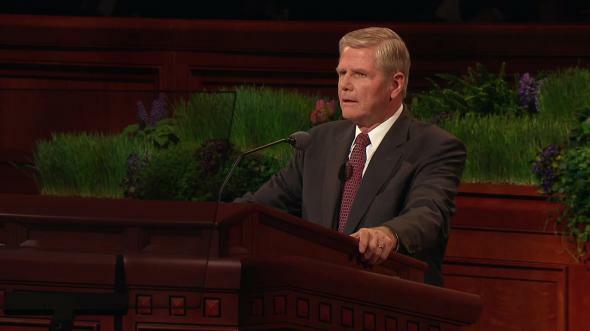 If you don’t believe in that system and if you don’t use it, you don’t have a true testimony of the power of the priesthood, and you cannot succeed. If you use this system and are faithful, your success is guaranteed. I know people respond when you obtain the power of God which pertains to the priesthood. I have heard Elder LeGrand Richards say, “If you were to divide your ward and put all the active members in one ward and the inactive in the other, and give me the inactive ones, within a year I would give you a ‘run for your money.’” I know he would, and I know he would also have the most fun. I once heard a stake president mention the great success of one of his elders quorum presidents. He said, “His name is Hershel Pedersen. Perhaps you have heard of him. They used to call him ‘Bones’ when he played for BYU.” Well, I, along with many of you had heard of Brother Pedersen. As a matter of fact he grew up in my stake. He is one of the seven sons of Oliver Cowdery Pedersen, who all went on missions, most of them to Denmark. I heard his report when he returned from his mission, and I signed his temple recommend when he was married. So I was interested. Think of the potential if all who bear the priesthood were deeply involved in the work of the Lord. Compared to what is available, we have been running on only one or two cylinders. 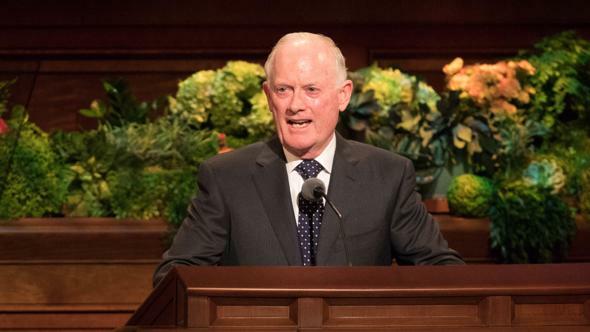 In missionary work some stakes have raised their sights so much that each ward is going to bring in as many new members as the entire stake used to. In temple work I have seen stakes, who worked through priesthood power, make yearly increases that were greater than the total performance of average stakes nearby. In every activity in which the priesthood is involved, I become excited when I see how far we can go if we have faith enough to mobilize the great army of men of the priesthood. Not a testimony like Laman and Lemuel. And I know some say, “He doesn’t understand how tough it is in our quorum.” Well, Nephi didn’t either; but Nephi had a testimony. In the name of Jesus Christ. Amen.